6102 64PII 6 Pfg. Black yellow green, reconstruction 1946, proof on greyish typewriter paper in lines perforation 11 ½ in lieu of 11, horizontal pair from lower margin, in perfect condition mint never hinged, photo expertize \"genuine and immaculate\" Ströh BPP. Michel 2800,- €. 6103 64PII 6 Pfg. 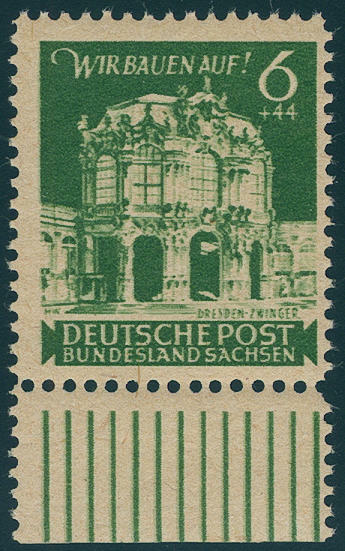 Dresdner castle 1946, proof in black yellow green, lines perforation 11 ½ in lieu of 11, fresh colors and in perfect condition mint never hinged from lower margin, photo expertize \"genuine and immaculate\" Ströh BPP. Michel 1400,- €. 6104 65aF 12 Pfg. 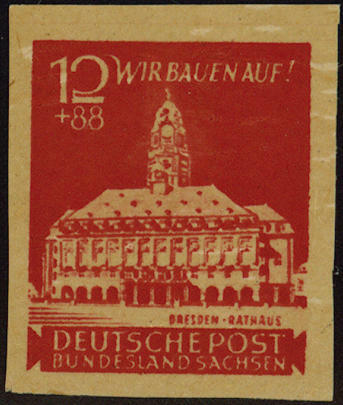 Dark orange red, perforated 11 ½ in lieu of 11, fresh colors from lower margin with additional horizontal double perforation, in perfect condition mint never hinged there are very few examples with this experimental perforation have become known. These are among the great rarities of the SBZ! Photo expertize for former pair \"genuine and immaculate\" Ströh BPP. Michel 4200,- €. 6105 65bGU 12 Pfg. Orange red, printed on the gummed side and unperforated, wonderful fresh colors, large margins all around, in perfect condition mint never hinged a rare stamp in this kind! Photo expertize \"genuine and immaculate\" Ströh BPP. 6106 65PI 12 Pfg. 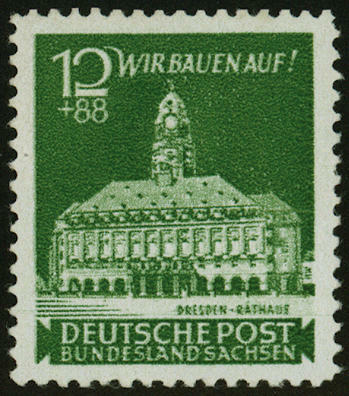 Reconstruction 1946, the very scarce proof in blackish yellowish green on white, chalky paper with lines perforation 11 ½ in lieu of 11, smooth gum, in perfect condition mint never hinged, outstanding perforated and centered in utterly perfect condition. There are only a few copies became known, whereby it be here about the most beautiful us known copy act! Photo expertize \"genuine and immaculate\" Ströh BPP. Michel 3000,- €. 6107 ∆ 66/71XA 1-12 Pfg. Province crest, all six values with postmaster perforation L11 ½ on wonderful white letter pieces, all perfect used, a dream set for your highest requirements! Photo expertize \"genuine and immaculate\" Ströh BPP. 6108 ✉ 66X 1 Pfg. 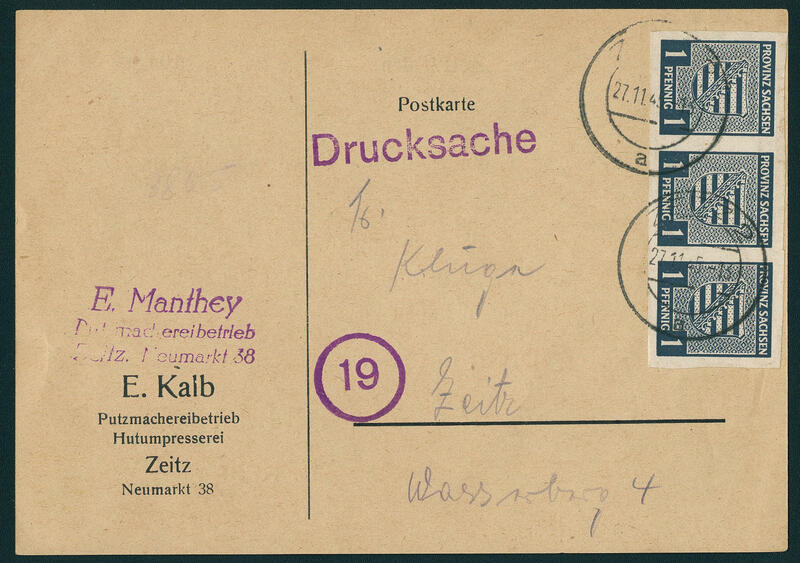 Blackish greenish blue, falling watermark, horizontal strip of three as correctly franked multiple franking on printed matter card from \"ZEITZ 27.11.45. \" in the local usage transported. Printed matters of this kind are rare, which here is a particularly beautiful example! Photo expertize \"genuine and immaculate\" Ströh BPP. 6109 ✉ 67XD,69XDa 3 Pfg. Dark-orange-brown in the vertical pair from margin of sheet and 6 Pfg. 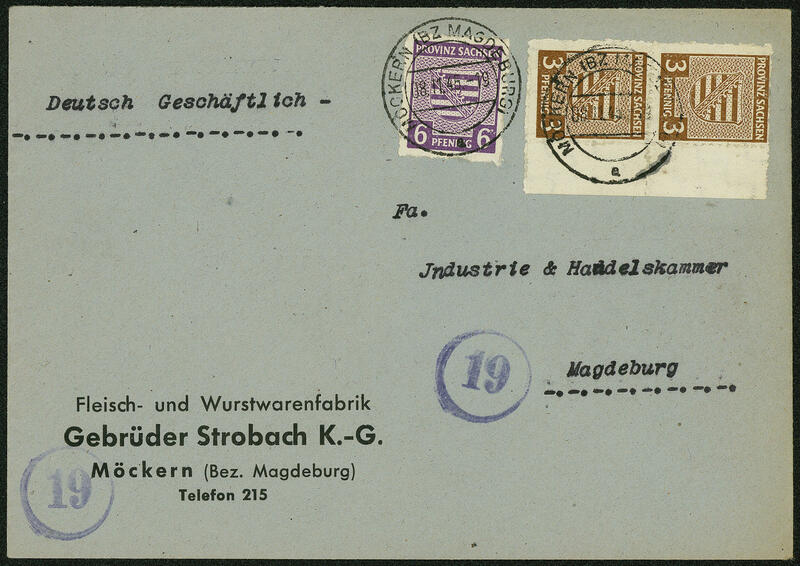 Gray violet, all values rouletted from post office Möckern, in perfect condition on very nice, commercially used, correctly franked cover from \"MÖCKERN 8.11.45. \" to Magdeburg. 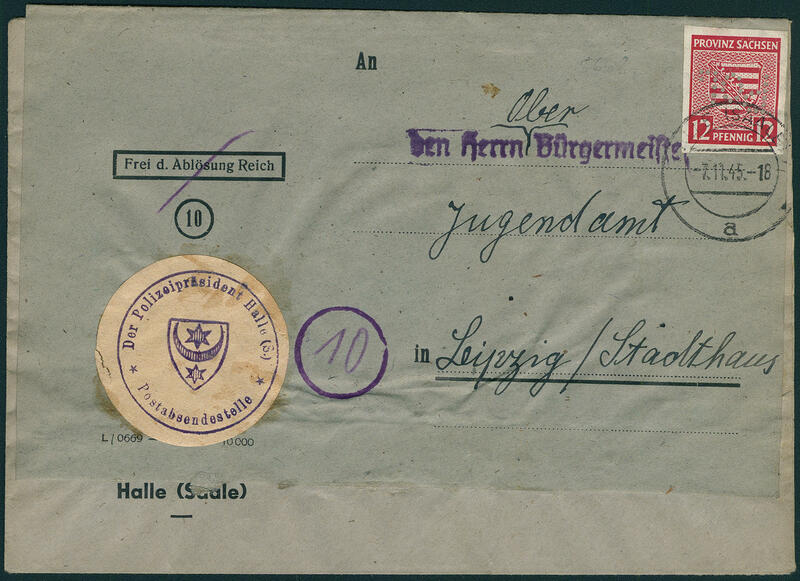 A fantastic franking of prime rarity! Photo expertize \"genuine and immaculate\" Ströh BPP. 6110 ⊙ 69XAb 6 Pfg. 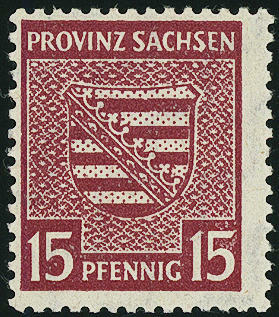 Coat of arms reddish gray violet with lines perforation 11 ½ from post office Wittenberg Luther town, fresh colors and neat cancelled, photo expertize \"genuine and immaculate\" Ströh BPP. 6111 69XBb 6 Pfg. 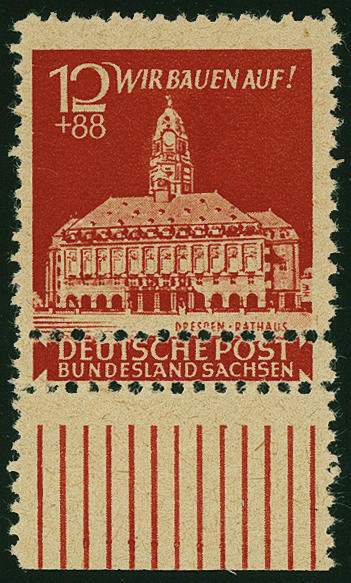 Reddish gray violet with lines perforation 11 ½ from post office Naumburg and on the back overprint \"cathedral city NAUMBURG / SAALE\", fresh colors and very well perforated, in perfect condition mint never hinged this on the back overprint is with this colour in the Michel special catalogue unlisted and is extremely rare! Photo expertize \"genuine and immaculate\" Ströh BPP. 6112 ∆ 70XD 8 Pfg. 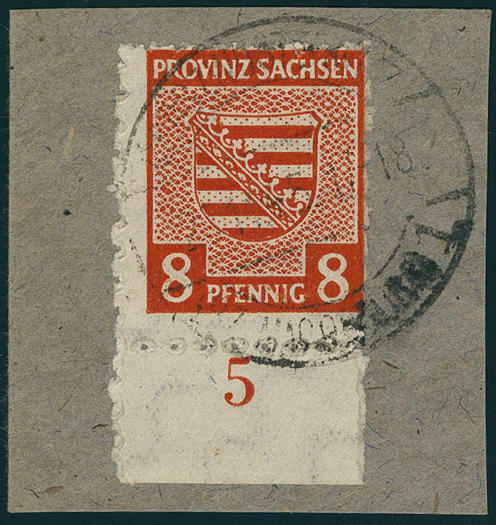 Yellowish red with scarce sewing roulette from lower margin, in perfect condition on piece, expertized Ströh BPP. Michel 800,- €. 6113 ✉ 71XPOL 12 Pfg. 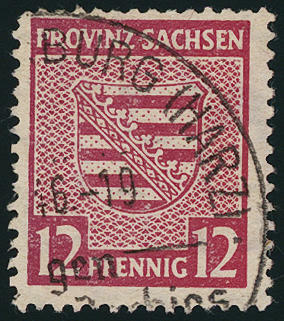 Country Saxony cut with inverted punching \"Pole\" on commercially used cover from \"HALLE 7.11.45. \", dispatched from police chief to the child protective services in Leipzig. Commercially related covers with POL punching are extraordinarily rare! 6114 73XPa 1 Pfg. Country Saxony, falling watermark, horizontal pair from left margin of sheet with very rare variety \"glued paper web\", fresh colors and in perfect condition mint never hinged a Soviet Zone rarity, by Michel catalogue fully undervalued. Photo expertize \"genuine and immaculate\" Ströh BPP. 6115 74DIb 8 Pfg. 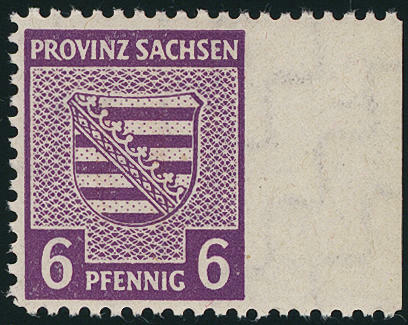 Black violet, postmaster perforation from Coswig L10, fresh colors and very well perforated from right margin of sheet, in perfect condition mint never hinged, expertized Zierer BPP. Michel 650,- €. 6116 ⊙ 75bY 5 Pfg. 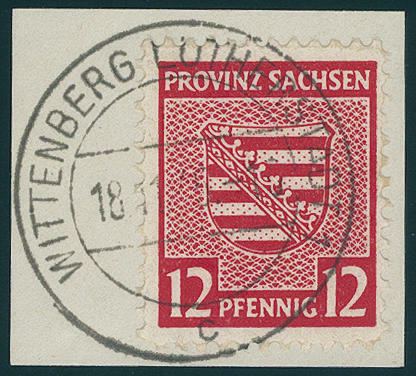 Gray green, increasing watermark, fresh colors and very well perforated, neat cancelled \"WITTENBERG Luther town 12.1.46. \", an especially nice copy this very rarely colour, photo expertize \"genuine and immaculate\" Ströh BPP. 6117 ⊙ 79bY 12 Pfg. 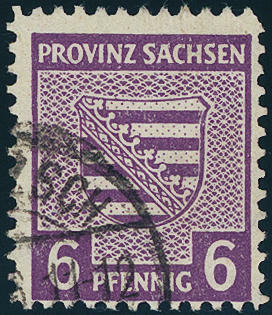 Light purple carmine, increasing watermark, wonderful fresh colors, above slightly irregular perforated, with clean special cancellation \"BLANKENBURG. \", a very scarce colour, photo expertize Ströh BPP. Michel 3000,- €. 6118 79Yb 12 Pfg. 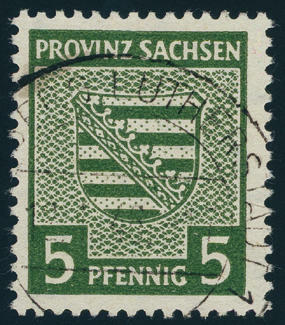 Province crest 1945, increasing watermark, horizontal strip of ten with on both sides margin of sheet. 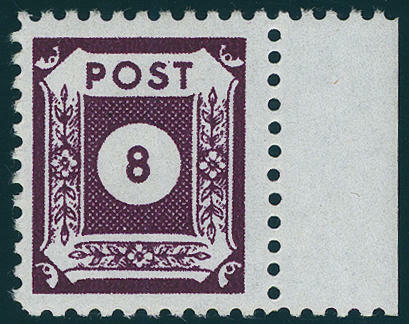 The two of them left stamps in of the rare colour light purple carmine (two various color shades), as well others eight stamps in the colour dark rose red, in perfect condition mint never hinged very attractive and scarce unit! Photo expertize \"genuine and immaculate\" Ströh BPP. Michel 2000,- €. 6119 80aXI 15 Pfg. 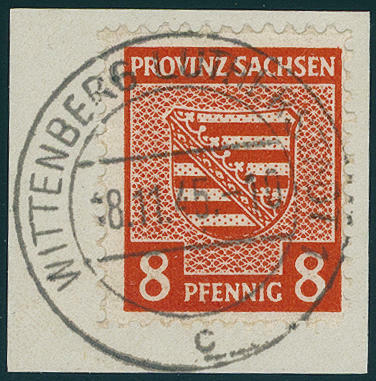 Medium lilac carmine, falling watermark, rare plate flaw \"SE IN Saxony smudged and retouches\", which only on field 66 in a part of issue occurred, fresh colors and very well perforated, in perfect condition mint never hinged a SBZ-rarity! Photo expertize \"genuine and immaculate\" Ströh BPP. Michel 1800,- ? 6120 ✉ 80X 15 Pfg. 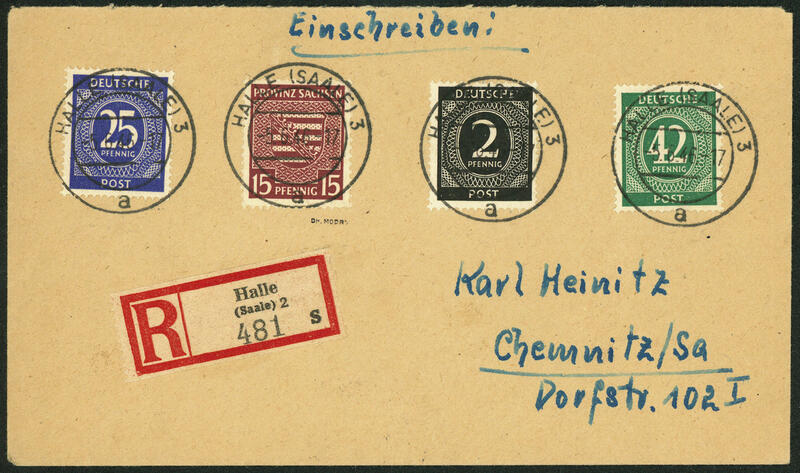 Country Saxony with scarce falling watermark, wonderful fresh colors and very well perforated in perfect condition with additional franking allied occupation on very nice small-format registered cover, correctly franked franked from \"HALLE 5.6.46\" to Chemnitz with arrival postmark. One of the most beautiful known covers this watermark rarity! Photo expertize \"genuine and immaculate\" Ströh BPP. Michel 1440,- €. 6121 83aXUdr 30 Pfg. 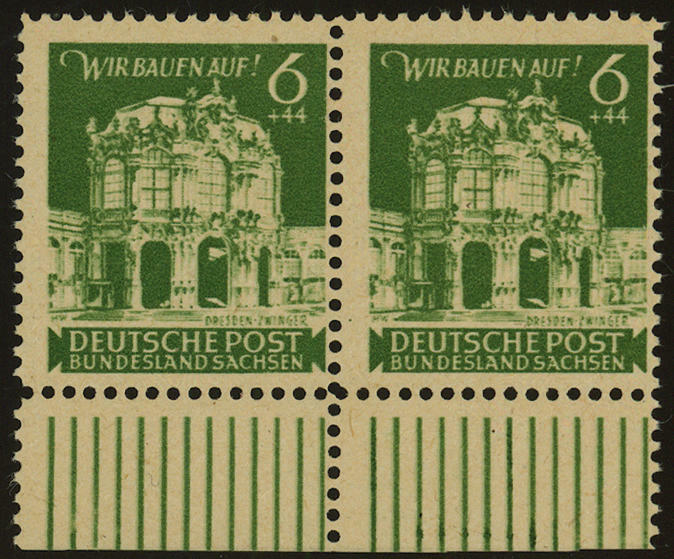 Dark olive, falling watermark, three sided unperforated in the horizontal margin pair with normal stamp, fresh colors and in perfect condition mint never hinged in perfect condition. A very decorative and scarce variety! Photo expertize \"genuine and immaculate\" Ströh BPP.